WM Rossetti 1849–53’, Præraphaelite diaries and letters , ‘The PRB journal kept, London, 1900, pp 203–309: pp 280, 282, 286, 287. Tim Barringer, Dictionary of National Biography , ‘Brown, Ford Madox (1821–1893)’, Oxford, 2004, pp 23–28: p 25. Mary Bennett, Pre-Raphaelite papers , ‘The price of “Work”: the background to its first exhibition, 1865’, London, 1984, pp 143–52: p 251 note 2. Mary Bennett, Burlington Magazine , ‘Ford Madox Brown at Southend in 1846: some lost paintings’, London, Feb 1973, pp 74–79: pp 74, 78. Mary Bennett, The dictionary of art , ‘Brown, Ford Madox’, London, 1996, p 877. Mary Bennett, Burlington Magazine , ‘A check list of Pre-Raphaelite pictures exhibited in Liverpool 1846–1867, and some of their northern collectors’, London, 1963, pp 486–95: p 492. Mary Bennett, Burlington Magazine , ‘“Waiting: An English Fireside of 1854–5”: Ford Madox Brown’s first modern subject picture’, London, Dec 1986, pp 903–04, p 904. Mr Ford Madox Brown’, Reader , ‘“Work” and other pictures, 01 Apr 1865, pp 377–78: p 378. Mr Madox Brown’, Saturday Review , ‘Exhibition of pictures, London, 25 Mar 1865, pp 345–46: p 345. James Bruce, Sydney Morning Herald , ‘Victorian values; Gallery review’, Sydney, 18 Nov 2000, p 12. James Bruce, Sydney Morning Herald , ‘The dying art of empire’, Sydney, 10 Mar 2002, p 13. Laurent Bury, Cahiers Victoriens & Édouardiens , ‘Which medievalism? The case of Ford Madox Brown’, Montpellier, Apr 2011, pp 93–105. Jay Butler, Catalogue of Acquisitions 1975 , 'Ford Madox Brown’s Chaucer at the Court of Edward III’, Sydney, 1977, pp 33–40, illus p 34. Edmund Capon, Portrait of a Gallery , 'European art in the old courts', Sydney, 1984, p 14, col illus p 15. See fig 66 for manuscript illumination of the same subject. Nicole Chareyron, Bulletin des anglicistes médiévistes , ‘Une reconstitution imaginaire de la cour d’Edouard III par le peintre Ford Madox Brown (1821–1893): Le Moyen Âge après le Moyen Âge dans le monde anglophone’, Paris, 1995, pp 26–46. Deborah Cherry, Burlington Magazine , ‘The diary of Ford Madox Brown [review]’, London, Jun 1983, pp 371–72: p 371. Susan Clayton, Cahiers Victoriens & Édouardiens , ‘Britomart quest anew: Victorians revive the Elizabethan Faerie Queene as campaigns for women’s suffrage intensify’, Montpellier, Apr 2010, pp 323–38. Julie F Codell, Victorian Studies , ‘Expression over beauty: facial expression, body language, and circumstantiality in the paintings of the Pre-Raphaelite Brotherhood’, Bloomington, 1986, pp 255–90: pp 257 note 6, 261, illus p 262. Sidney Colvin, Portfolio , ‘English painters of the present day’, London, Jun 1870, pp 82–86: p 83. Sidney Colvin, English painters of the present day , 'Ford Madox Brown', London, 1871, p 33. Reprint of Colvin 1870. Critic, Sydney Morning Herald , ‘Art in Sydney’, Sydney, 12 Feb 1887, p 7. Colin Cruise, Yearbook of English Studies , ‘“Sick-sad dreams”: Burne-Jones and Pre-Raphaelite Medievalism’, England, 2010, pp 121–40: pp 128–29. Colin Cruise, Burlington Magazine , ‘“Sincerity and earnestness”: DG Rossetti’s early exhibitions 1849–53’, London, Jan 2004, pp 4–12: p 11. Gerard Curtis, Art Bulletin , ‘Ford Madox Brown’s Work: an iconographic analysis’, Chippendale, Dec 1992, pp 623–36: p 629. DSM, Saturday Review , ‘Madox Brown’, London, 20 Feb 1897, pp 191–92: p 191. Jenny Elkan, Journal of Pre-Raphaelite Studies , ‘Ford Madox Brown’s “Chaucer at the court of Edward III”’, Toronto, 1984, pp 87–92. Eccleston Du Faur, Sydney Morning Herald , ‘To the editor of the Herald’, Sydney, 26 Nov 1879, p 7. Cedric Flower, Bulletin , ‘Art: Victorians in NSW’, Sydney, 13 May 1972, p 39. Renée Free, AGNSW Collections , 'The Western Heritage, Renaissance to Twentieth Century', Sydney, 1994, pp 108, 133, col illus p 132. Renée Free, Art and Australia, vol 10, no 1 , ‘European Collection’, Sydney, Jul 1972, pp 63–64, illus p 66. Renée Free, Art Gallery of New South Wales handbook , 'European', Sydney, 1988, p 44, illus p 45. Anne Gerard-Austin, Look , 'Poetry and Motion', Sydney, Jul 2017-Aug 2017, pp 26-27, col illus p 27. Doug Hall, Brought to Light: Australian Art 1850–1965 from the Queensland Art Gallery collection , 'Learning from the first lesson: George Folingsby and genre painting. G.F. Folingsby The first lesson', Brisbane, 1998, pp 22–25: p 22. L H, Academy , 'Art', London, 14 Nov 1896, p 395. Terry Ingram, Australian Financial Review , ‘Sketch bought for a song but not by the songwriter’, Sydney, 09 Nov 1995, p 47. Bruce James, Art Gallery of New South Wales handbook , 'Western Collection: Painting and Sculpture', Sydney, 1999, p 35, col illus p 35. Joseph A Kestner, Contemporary Literature , ‘Ford Madox Ford as a critic of the Pre-Raphaelites’, Wisconsin, 1989, pp 224–39: p 226. Andrew Lambirth, Spectator , ‘Fine lines: the poetry of drawing: Pre-Raphaelite designs, studies and watercolours’, London, 19 Feb 2011, pp 46–47, p 46. Jane Langley, Burlington Magazine , ‘Pre-Raphaelites or ante-Dürerites?’, London, Aug 1995, pp 501–08: p 505 note 24. See also p 505 and pls 28–29 for Ashmolean oil sketch and suggested influence of Memling. Jacques Lethève, Gazette des Beaux-Arts , ‘La connaissance des peintres Préraphaelites anglais en France’, Paris, 1959, pp 315–28: illus p 320. A view of the English gallery at the Paris Exposition Universelle of 1855 in which Brown’s painting is just visible. Bernard Levin, Times , ‘The barren Brotherhood’, London, 07 May 1984, p 12. LG de Libra, Sydney Morning Herald , ‘The Art Gallery [letter]’, Sydney, 03 Feb 1883, p 5. WJ Loftie, Magazine of Art , ‘Art in Australia’, London, 1886, pp 174–75: p 175. Mary Lutyens, Pre-Raphaelite papers , ‘Walter Howell Deverell (1827–1854)’, London, 1984, pp 76–96: p 78. Jonathan Mayne, Burlington Magazine , ‘Ford Madox Brown, at Liverpool, Manchester and Birmingham’, London, Mar 1965, p 156. John McDonald, Sydney Morning Herald , ‘Messages from the masters: visual art: visual art’, Sydney, 12 Jun 2010, p 18. John McDonald, Art of Australia. Vol 1: Exploration to Federation , ‘Shelter of freedom and boast of the world’, Sydney, 2008, p 250, col illus p 251. Sandra McLean, Courier Mail , ‘Love & death – Art in the age of Queen Victoria’, Brisbane, 01 Jun 2002, p [F02]. Martin Meisel, Studies in Romanticism , ‘Pictorial Engagements: Byron, Delacroix, Ford Madox Brown’, Boston, 1988, pp 579–603: pp 583–85, 588. F J M, Speaker , 'Art', London, 19 Jan 1901, pp 425–27: p 426. Alice Miskimin, Modern Philology , ‘The illustrated eighteenth-century Chaucer’, Chicago, Aug 1979, pp 26–55: p 36 and note 18. William Moore, Studio , ‘The public art galleries of Australia’, London, Apr 1913, pp 202–13: p 209. William Moore, Brisbane Courier , ‘Art and artists – Ford Madox Brown’, Brisbane, 25 Apr 1931, p 16. William Moore, Brisbane Courier , ‘Art and artists. Some high prices’, Brisbane, 27 May 1933, p 19. Bede Nairn, Australian Dictionary of Biography , ‘Combes, Edward (1830–1895)’, Melbourne, 1969, pp 445–46, p 446. Elizabeth Prettejohn, Model and supermodel: the artist’s model in British art and culture , ‘The Pre-Raphaelite model’, Manchester, 2006, pp 26–46: pp 31–33, 34, 42 note 28, illus p 31, fig 5 (detail). Velma Bourgeois Richmond, Chaucer Review , ‘Edward Burne-Jones’s Chaucer portraits in the Kelmscott “Chaucer”’, Pennsylvania, 2005, pp 1–38: p 34 note 21. 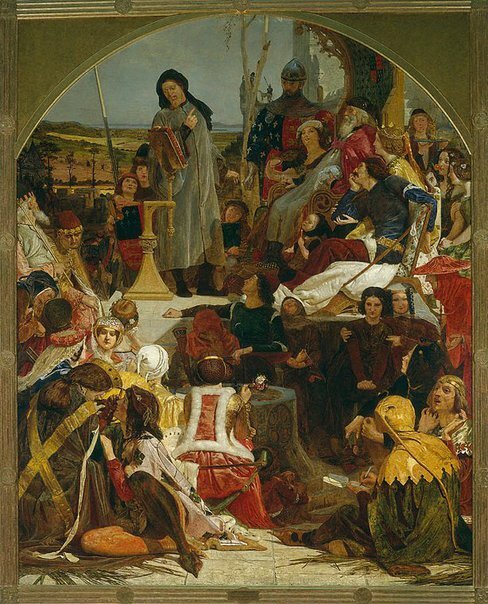 Velma Bourgeois Richmond, Christianity and literature , ‘Ford Madox Brown’s Protestant Medievalism: Chaucer and Wycliffe’, Pennsylvania, Spring 2005, pp 363–96, illus p 394. Bernard Rigby, Look , ‘The brain and portraiture: what we see and how we see it’, Sydney, Feb 2005, p 13. Helene E Roberts, Browning Institute Studies , ‘Victorian Medievalism: Revival or Masquerade?’, Cambridge, 1980, pp 11–44: pp 36–37, illus pp 33, 34 (study). Dante Gabriel Rossetti, Spectator , ‘Fine arts – exhibition of sketches and drawings in Pall Mall East’, London, 06 Sep 1851, pp 859–60. Critical of the Chaucer, the pictorial effect of which would have been improved if exhibited with the wings, as here demonstrated in the [Ashmolean] oil sketch. Dante Gabriel Rossetti, Spectator , ‘Fine arts: the Royal Academy exhibition’, London, 10 May 1851, pp 451–52: p 452. Lucy Rossetti, Magazine of Art , ‘Ford Madox Brown’, London, 1890, pp 289–92: pp 290–99. WM Rossetti, Magazine of Art , ‘The portraits of Dante Gabriel Rossetti – I’, London, Jan 1889, pp 21–26: pp 25–26. W.M. Rossetti, Fraser's Magazine , ‘Mr Madox Brown’s exhibition, and its place in our school of painting’, London, May 1865, pp 598–607: p 607. W.M. Rossetti, Crayon , ‘Correspondence – Art news from England’, New York, 23 May 1855, pp 327–30, p 327. F S S, Sydney Morning Herald , ‘The Pre-Raphaelites in the National Gallery’, Sydney, 07 May 1910, p 5. Sam Smiles, Visions of antiquity: the Society of Antiquaries of London 1707-2007 , 'Art and antiquity in the long nineteenth century', London, 2007, p 136, illus p 137. Roger Smith, Costume , ‘Bonnard’s Costume Historique, a Pre-Raphaelite source book’, London, 1973, pp 28–37: p 29, illus p 30. David Sonstroem, Victorian Literature and Culture , ‘Teeth in Victorian Art’, New York, Sep 2001, pp 351–82: p 370. Hilary Spurling, Observer , ‘Onions for supper’, London, 10 Jan 1982, p 46. Review of Virgina Surtees (ed) 'The diary of Ford Madox Brown', 1981. Harold WH Stephen, North Eastern Ensign , ‘Sydney sketches – The Art Gallery, Part I’, Benalla, 10 Aug 1883, suppl p 2. Harold WH Stephen, Warwick Argus , ‘Sydney sketches’, St. Lucia, 05 Jan 1884, suppl p 1. Harold WH Stephen, Border Watch , ‘Sydney sketches’, Mt Gambier, 08 Sep 1883, suppl p 2. F. G. Stephens, Portfolio , 'Dante Gabriel Rossetti', London, May 1894, pp 5–94; pp 24–25. Chaucer's head based on Rossetti's. F G Stephens, Portfolio , ‘Mr Ford Madox Brown: his early studies and motives’, London, Jan 1893, pp 62–69: pp 64, 66. Andreas Strobl, Allgemeines Künstlerlexikon: die bildenden Künstler aller Zeiten und Völker , ‘Brown, Ford Madox’, Munich, 1996, p 414. D. F. T., Look , 'Chaucer gets a facelift', Heidelberg, Feb 1993, p 9, col illus p 9. Daniel Thomas, Art Gallery of New South Wales Quarterly , 'The Art Gallery of New South Wales', Sydney, Jan 1960, p 13. Daniel Thomas, Art Gallery of New South Wales Quarterly , ‘Young British painters’, Sydney, Oct 1964, p 206. Daniel Thomas, Art Gallery of New South Wales Quarterly , ‘Some Pre-Raphaelite paintings’, Sydney, Oct 1962, pp 119–25, pp 119–21, illus p 120 and p 122 (details). Julian Treuherz, Pre-Raphaelite Papers , 'The Pre-Raphaelites and medieval illuminated manuscripts', London, 1984, pp 153–169: pp 154-55. Giles Waterfield, Burlington Magazine , ‘Antiquaries in Britain. London’, London, Dec 2007, pp 871–72: p 872. Review. Gail S Weinberg, Burlington Magazine , ‘Dante Gabriel Rossetti’s “Salutation of Beatrice” and Camille Bonnard’s “Costumes Historiques”’, London, Oct 1999, pp 622–623: p 622. Eriko Yamaguchi, Journal of Pre-Raphaelite Studies , ‘Rossetti’s use of Bonnard’s “Costumes Historiques”: a further examination, with an appendix on other Pre-Raphaelite artists’, Toronto, Fall 2000, pp 5–36: pp 5, 9, 22. CD Young, Sydney Morning Herald , 'To the editor of the Herald', Sydney, 05 Dec 1879, p 6. Helen Zimmern, Emporium , ‘Artisti contemporanei: Ford Madox Brown’, Nov 1897, pp 323–39: p 329, illus p 328. Australian Town and Country Journal , 'The fine arts', Sydney, 14 Apr 1877, p 19. Australian Town and Country Journal , [No Title], Sydney, 21 Apr 1877, p 628. Inquirer & Commercial News , 'Art at the Antipodes', Perth, 25 Apr 1877, p 3. List of pictures in the gallery of the Academy of Art (Elizabeth Street, near Hunter Street) , Sydney, Oct 1877, p 333. A copy inserted in Trustees’ minutes 1877. Trustees' minutes 1878 , 20 Feb 1878, p 361. Sydney Morning Herald , 'Art', Sydney, 21 Sep 1877, p 4. Sydney Morning Herald , 'Ford Madox Brown', Sydney, 03 May 1877, p 6. Correspondence 62/1877, letter from the Australian Museum , 07 Dec 1877. Custody of Chaucer painting: decision to be referred to a committee. Correspondence 2/1878, letter from the Australian Museum , 11 Feb 1878. Agrees to hang Chaucer. Correspondence 2/1878, draft of a letter to the Australian Museum, 21 Feb 1878 (appended to a letter from the Australian Museum of 11 Feb 1878) , 21 Feb 1878. Accepts terms for the hanging of the Chaucer in the Australian Museum. Correspondence 3/1878, letter from Australian Museum , 23 Feb 1878. Hanging of Chaucer at museum. Correspondence 4/1878, letter from Australian Museum , 09 Mar 1878. Hanging of Chaucer at museum. Athenaeum , ‘The international exhibition’, London, 11 May 1878, pp 607–09: p 607. Correspondence 45/1882, letter from Ford Madox Brown , 20 Nov 1882. Refers to an article in the London Daily News reporting the destruction of his work by fire and offers to paint a replacement. Argus , ‘“Sabbath-breaking” in Sydney’, Melbourne, 18 May 1878, p 4. The Sydney Morning Herald , ‘The museum. To the editor of the Herald’, Sydney, 19 Apr 1879, p 3. Correspondence 3/1883, letter from Australian Museum , 19 Jan 1883. Forwarding Brown’s offer to repaint the Chaucer. Eighth annual report of the New South Wales Academy of Art , Sydney, 1879, p 4. For the year 1878–79. Trustees' minutes 1880 , 07 Jul 1880, p 615. Ninth annual report of the New South Wales Academy of Art [for the year 1879–80] , Sydney, 1880, p 5. For the year 1878–79. Correspondence 29/1880, letter from Australian Museum , 22 Jul 1880. Museum agrees to return Chaucer to Art Gallery. Illustrated Sydney News , 'The Art Gallery of NSW', Sydney, 20 Nov 1880, pp 10–11: p 10. British painters of the eighteenth and nineteenth centuries , London, circa 1880, p 117. See also p 119 for Tate replica. York Herald , [No Title], 20 Nov 1882, p 6. Sydney Mail , ‘New South Wales Art Gallery’, Sydney, 11 Dec 1880, p 1113. Sydney Mail , ‘The picture gallery and the museum’, Sydney, 08 Apr 1882, p 548. Liverpool Mercury , ‘The Walker Art Gallery’, Liverpool, 22 Apr 1882, p 5. Sydney Morning Herald, no 13896 , ‘The Art Gallery’, Sydney, 12 Oct 1882, p 8. Daily News , London, 11 Nov 1882, p 5. This must be the article referred to in Brown’s letter of 20 Nov 1882. Athenaeum , 'Fine-art gossip', London, 18 Nov 1882, pp 668–69: p 669. Manchester Times , 'Art and literary gossip', Manchester, 18 Nov 1882, p 8. Manchester Times , [No Title], Manchester, 18 Nov 1882, p 8. Baner ac Amserau Cymru , ‘Cynnwysiad’, Liverpool, 18 Nov 1882, p 1. Manchester Times , [No Title], Greater Manchester, 25 Nov 1882, p 6. The aesthetic movement in England , London, 1882, p 44. Trustees’ minutes 5 Mar 1883 , 05 Mar 1883, p 152. To reply to Brown thanking him for his offer to repaint the picture but assuring him that the work is not destroyed. Catalogue descriptive and critical of the Art Gallery with Sydney art notes , Sydney, 1883, p 14. Not an official publication. Catalogue of the Art Gallery of New South Wales ... published by sanction of the trustees , Sydney, 1883, p 27, no 65, illus (sketch by EL Montefiore) p 27. Sydney Morning Herald , 'News of the day', Sydney, 25 Jan 1883, p 9. Manchester Times , 'Art and literary gossip', Manchester, 03 Feb 1883, p 8. Manchester Times , ‘Art and literary gossip’, Manchester, 03 Feb 1883, p 8. Athenaeum , ‘Fine-Art Gossip’, London, 03 Feb 1883, pp 161–62: p 161. Manchester Guardian , ‘Literary and other notes’, Manchester, 03 Feb 1883, p 5. Catalogue of the National Gallery of New South Wales , Sydney, 1884, p 27, no 67, illus (sketch by EL Montefiore) p 27. Sydney Morning Herald , ‘News of the day’, Sydney, 17 Jun 1885, p 9. Sydney Morning Herald , ‘My impressions of Sydney, V – In The Art Gallery’, Sydney, 18 Sep 1886, p 8. Athenaeum , ‘The collected works of Dante Gabriel Rossetti’, London, 12 Mar 1887, pp 346–49: p 348. Sydney Morning Herald , ‘Pictures in Sydney, II – Subject painting at the Art Gallery’, Sydney, 11 Jun 1887, p 6. Collected works of Dante Gabriel Rossetti , London, 1886, pp 485–86, 499–501. Art lectures delivered by Sidney Dickenson, MA at the National Art Gallery of New South Wales , Sydney, 1889, p 44. Glasgow Herald , ‘Our London correspondence’, Glasgow, 14 Apr 1890, p 7. Preferences in art, life and literature , London, 1892, p 10. Advertiser , ‘Obituary. Ford Madox Brown. London, Oct 7’, Adelaide, 09 Oct 1893, p 5. Portfolio , ‘Art chronicle’, London, 24 Jan 1893, pp 1–26: p 23. Dundee Courier & Argus , ‘Death of a celebrated painter’, Dundee, 07 Oct 1893, p 5. Sydney Morning Herald , ‘Death of Mr. Madox Brown. London, Oct. 7’, Sydney, 09 Oct 1893, p 5. Daily News , [No Title], London, 07 Oct 1893, p 5. South Australian Register , ‘Death of Mr. Madox-Brown. London, Oct 7’, Adelaide, 09 Oct 1893, p 5. Glasgow Herald , ‘Death of Mr Ford Madox Brown’, Glasgow, 07 Oct 1893, p 4. Aberdeen Weekly Journal , ‘Death of Mr F M Brown’, Aberdeen, 07 Oct 1893, p 5. The Brisbane Courier , ‘Cable Messages. (From our London correspondent. )’, Brisbane, 09 Oct 1893, p 5. Singleton Argus , ‘General gleanings’, Singleton, 11 Oct 1893, p 1. British Architect , ‘Ford Madox Brown’, London, 13 Oct 1893, pp 252–53: p 252. The Argus , ‘Ford Madox Brown’, Melbourne, 13 Oct 1893, p 6. Athenaeum , ‘Mr Ford Madox Brown’, London, 24 Oct 1893, pp 526–27: p 527. Australian Town and Country Journal , ‘Death of Mr. Madox Brown’, Sydney, 14 Oct 1893, p 46. Graphic , ‘The late Mr Ford Madox-Brown’, 14 Oct 1893, p 483. Brisbane Courier , ‘An eminent British artist’, Brisbane, 19 Jan 1894, p 4. Queenslander , ‘One of Britain’s foremost artists’, Brisbane, 20 Jan 1894, p 118. Dante Gabriel Rossetti , London, May 1894, pp 24–25 and p 25 note 1. Reprint of the article in Portfolio, May 1894. Ford Madox Brown: a record of his life and work , London, 1896, pp 41–43, 49, 57, 62–63, 68–74, 76 note 1, 97–98, 111, 158, 240, 306–07, 359–60, 409, 411–12, 432, 434, unnumbered plates. The illus opp p 71 shows the Tate version wrongly captioned as from the AGNSW. For oil sketches and replica see also pp 67, 115, 198, 232–34, 436. Australian Town and Country Journal , ‘Literary gossip’, Brisbane, 04 Jul 1896, p 26. Australian Town and Country Journal , 'Gossip', Sydney, 12 Dec 1896, p 44. Exhibition of the works of Ford Madox Brown , London, 1897, pp 10–12, under no 16. Quotes extensively from Brown’s diary. See also no 9 for the Ashmolean sketch. Art Journal , ‘The February exhibitions in London’, London, 1897, p 92. Athenaeum , ‘Ford Madox Brown: a record of his life and work’, London, 27 Feb 1897, pp 284–85: p 285. Review of Hueffer 1896. Sydney Morning Herald , ‘Mr William Michael Rossetti’, Sydney, 12 Mar 1897, p 3. Athenaeum , ‘Ford Madox Brown: a Record of his Life and Work’, London, 13 Mar 1897, pp 352–54: p 353. Art Journal , ‘The February exhibitions in London’, London, Mar 1897, pp 92–94: p 92. Clarence and Richmond Examiner , ‘Tasma’s letter’, Sydney, 20 Mar 1897, p 8. Myra's Journal , ‘Ford-Madox Brown at the Grafton Galleries’, England, 01 Mar 1897, p 20. The art of painting in the Queen’s reign, being a glance at some of the painters and paintings of the British school during the last sixty years , London, 1897, p 94. British and foreign correspondence 9/1899, letter from George Bell & Sons , 20 Jun 1890. Requests permission to reproduce the painting in a book by Percy Bate. Observer , ‘Ancient and modern pictures: sale of the Bibby collection’, London, 04 Jun 1899, p 10. Conservation report by Arthur Murch , 20 Feb 1900. British and foreign correspondence BF4/1900, letter from Walter Rowlands , 05 Mar 1900. Requests photograph to illustrate his book ‘Scenes from the lives of the great authors’. Trustees’ minutes 1900 , 03 Apr 1900, p 233. Murch to continue his conservation treatment. Trustees’ minutes 1900 , 20 Apr 1900, p 245. Request from Walter Rowlands of Mass, USA, for photo of Ford Madox Brown Chaucer for an illustrated book. Among the great masters of literature: scenes in the lives of great authors: thirty-two reproductions of famous paintings , Boston, 1900, pp 61–66, illus opp p 62. Observer , ‘Art – At Burlington House’, London, 06 Jan 1901, p 6. Nineteenth century British painting , London, 2000, p 261. Art Journal , ‘Three important exhibitions’, London, Mar 1901, pp 95–96: p 95. Saint George , ‘The Pre-Raphaelite painters and their pictures at Glasgow International Exhibition’, London, Jan 1902, pp 18–26: p 24. Trustees’ minutes 1902 , 21 Mar 1902, p 435. Letter from London re lining canvas. The Liverpool school of painters : an account of the Liverpool Academy from 1810 to 1867 , London, 1904, p 20. Sydney Morning Herald , ‘All the world over’, Sydney, 20 Sep 1905, p 5. The Royal Academy of Arts: a complete dictionary of contributors and their work from its foundation in 1769 to 1904 , London, 1905-1906, vol 1, 1905, p 307. 8 vols. Pre-Raphaelitism and the Pre-Raphaelite Brotherhood , London, 1905, pp 123–26. Conservation report by Arthur Murch, after March 1906 , p 16. After March 1906. Trustees’ minutes 1906 , 18 May 1906. Restoration of Chaucer in hand ‘for lining and general renovating’. Sydney Morning Herald , ‘National Art Gallery’, Sydney, 13 Jul 1906, p 5. National Art Gallery of NSW illustrated catalogue , Sydney, 1906, pp 2–3, no 4, illus p 2. Some reminiscences of William Michael Rossetti , New York, 1906, vol1, pp 136–37, 145, 149. 2 vols. Correspondence 55/1906, Memo by Du Faur addressed to Arthur Murch , 19 Apr 1906. Du Faur has been told by Mr Callan that much of the painting is executed in watercolour or tempera and suggests that facing the picture may be fatal. Athenaeum , ‘Fine-Art Gossip’, London, 25 Aug 1906, pp 221–22: p 221. Collector and Art Critic , ‘Foreign Notes’, New York, Oct 1906, pp 346–48: p 348. Collector and Art Critic , 'Sales', New York, Oct 1906, pp 348–52: p 350. Tate verison. Catalogue of an exhibition of collected works by Ford Madox Brown , London, 1909, p 56, under no 44. For Manchester oil sketch see no 44. Loan exhibition of works by Ford Madox Brown and the Pre-Raphaelites , Manchester, 1911, pp xiv, xv, 10, under no 52, 12, under no 58. For sketches and drawings, see nos 52–53, 58, 118. Trustees’ minutes 1911 , 24 Mar 1911, p 123. 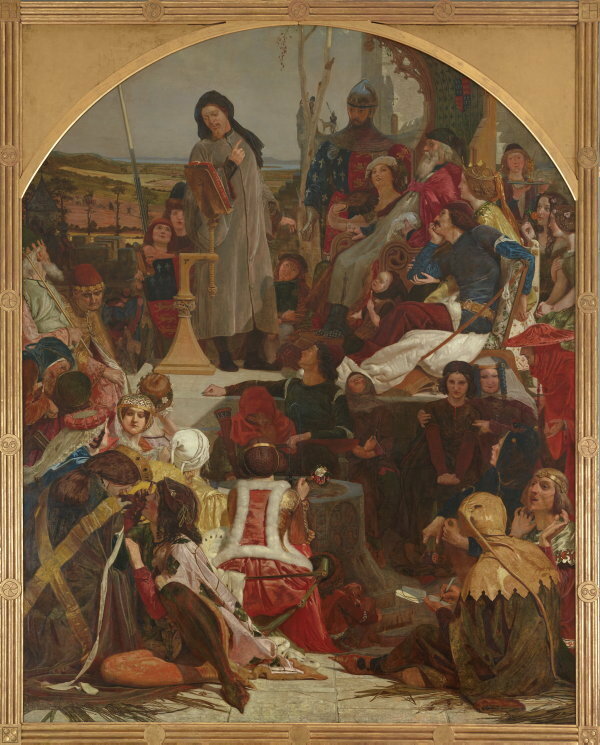 DS MacColl’s report: ‘Gallery seems to possess not a single picture of the first rank ... Madox Brown’s Chaucer is one of the few pictures that could tempt a European student to visit the gallery’. Picture study in schools, Records of the Education Society , Sydney, 1913, pp 21–23, 30, 33, illus p 22. Sydney Morning Herald , ‘Old masters needed: our art gallery condemned (by travelling connoisseur)’, Sydney, 08 Jun 1917, p 6. National Art Gallery of NSW: illustrated catalogue , Sydney, 1917, p 7, no 4, illus p 7. National Art Gallery of NSW: illustrated catalogue , Sydney, 1924, pp 5–7, no 1, illus p 5. Five hundred years of Chaucer criticism and allusion , Cambridge, 1925, vol 2, p 259, illus p 17. 3 vols, Illustration is of Tate replica. Townsville Daily Bulletin , ‘Holiday notes’, Townsville, 15 Jan 1929, p 11. Exposition rétrospective de peinture anglaise (XVIIIe et XIXe siècles) , Brussels, 1929, p 28, under no 17. See no 17 for a related drawing. Catalogue of the permanent collection of paintings in oil, tempera, water-colour, etc. , Birmingham, 1930, p 25. Manchester Guardian , ‘Gifts to the City Art Gallery’, Manchester, 23 May 1931, p 9. Manchester oil sketch. Sydney Morning Herald , ‘Lectures on Art’, Sydney, 26 Jun 1931, p 9. Correspondence 124/1931, letter from Stanley Kennedy North , London, 06 Jul 1931. Recommends treating the Chaucer by waxing the surface. Trustees’ minutes 1931 , 28 Aug 1931, p 1210. Cost approved for making a block of the Chaucer for reproduction (presumably in Art in Australia). Sunday Times , ‘New South Wales Art Gallery pictures’, Perth, 20 Jan 1932, p 24. Courier-Mail , '‘Critics’ praise – Pictures for Sydney – Sound purchases’, Brisbane, 26 Sep 1933, p 12. Sydney Morning Herald , ‘London topics’, Sydney, 28 Oct 1933, p 14. Townsville Daily Bulletin , 'Impressions', Townsville, 16 Jan 1934, p 5. Townsville Daily Bulletin , ‘Essays in brief. From Sydney’, Townsville, 28 Jan 1937, p 7. Townsville Daily Bulletin , ‘Painters and painting’, Townsville, 28 May 1937, p 12. Sydney Morning Herald , ‘Striking costumes in medieval sets’, Sydney, 11 Nov 1937, p 19. Townsville Daily Bulletin , ‘Essays in brief’, Townsville, 04 Sep 1939, p 2. Kalgoorlie Miner , ‘A new ABC adventure’, Perth, 17 Aug 1940, p 5. An exhibition of a selected number of subject pictures belonging to the national collection, typescript exh cat , Sydney, Jul 1943, p 7. Pre-Raphaelite drawings [from Birmingham] , London, 1947, p 12, under no 43. See no 43 for drawing. Paintings and drawings by British artists from the City of Birmingham Art Gallery , Aberystwyth, 1956, p 16, under no 40. See also nos 40–41 for drawing and watercolour. Argus , ‘Stories of the ages: the story of Griselda’, Melbourne, 06 Jul 1946, p 27. Supplement Argus Week-End Magazine. The Pre-Raphaelite brotherhood , Birmingham, 1947, pp 10, 29. See no 9 for Tate replica and nos 124–27 for drawings. Illustrated souvenir: eighty reproductions from the collections of the National Art Gallery of New South Wales: a selection of eighty reproductions mainly from the Australian collection and including examples from the British, French and Dutch , Sydney, circa 1950, illus p , pl 51. As ‘Chaucer reading his poems before John of Gaunt’. Illustrated souvenir: eighty-two reproductions from the collections of the Art Gallery of New South Wales: a selection of eighty-two reproductions mainly from the Australian collection and including examples from the British, French and Dutch , Sydney, circa 1958, illus p , pl 51. The Australian Children’s Pictorial , Sydney, Feb 1951, col illus cover. Ten decades, a review of British taste, 1851–1951 , London, 1951, np, under no 3. See no 3 for Tate replica. Some Pre-Raphaelite paintings and drawings , Cardiff, 1955, p 8, under no 7. See no 7 for preparatory drawing. The PRB journal: William Michael Rossetti’s diary of the Pre-Raphaelite brotherhood, 1849–1853 , Oxford, 1975, pp 81, 90, 91–92, 246, note 13.64. German romanticism and English art , New Haven, 1979, pp 221, 223. Ashmolean oil sketch illus fig 151. Catalogue of paintings in the Ashmolean Museum , Oxford, 1961, vol 1, p 29, under no 79. 2 vols. Pre-Raphaelite paintings from the Manchester City Art Gallery , London, 1980, p 27, 30, illus p 28, fig 4. See also pl 9 for Manchester oil sketch. A 2nd edition of this book appeared in 1993. Illustrated London News , ‘Ford Madox Brown’, London, 24 Oct 1964, pp 658–59: p 658. Trustees' minutes 1965 , 23 Jul 1965, p 5554. Ford Madox Brown returned from Liverpool undamaged. Victorian paintings , Sheffield, 1968, p 10. See no 15 for Tate replica. The Pre-Raphaelites , London, 1970, pp 19–20, illus p 21, fig 8. That ne’er shall meet again: Rossetti, Millais, Hunt , London, 1971, pp 151, 295. Daniel Maclise 1806–1870 , London, 1972, p 88. Australia’s national collections , North Ryde, 1980, p 250. The diary of Ford Madox Brown , New Haven, 1981, pp 1–17, 25, 40 note 48, 41–49, 63–68, 72–74, 84, 113, 116, 119, 121–25, 157, 162, 183, 199 (sketch), 212, illus pl 2 opp p 2. For oil sketches and watercolour, see also pp 74–76, 80, 163. Paintings from books: art and literature in England, 1760–1900 , Columbus, 1985, p 154. For the Ashmolean oil sketch see also pp 153–54, 340, 437–38. The Pre-Raphaelites and their times , Tokyo, 1985, p 147. The illus on p 147 is of the Tate replica. The Pre-Raphaelite sisterhood , London, 1985, pp 38, 40. Polyptyques: le tableau multiple du moyen âge au vingtième siècle , Paris, 1990, p 158, under no 31. See also no 31 for Ashmolean oil sketch. Catalogue entry by Sophie Gillot-Calais. Ford Madox Brown and the Pre-Raphaelite circle , London, 1991, pp 8, 25–26, 30–32, 33–34, 36–37, 41, 44–45, 48, 50, 51–52, 54–59, 142, col illus opp p 71, fig 80. See also figs 37, 40–41 for drawings, fig 76 for the Ashmolean oil sketch, and fig 80 for the Tate replica. British watercolours from Birmingham 1750–1900 , 1991-1992, p 212, under no 92. Exhibition at Tokyo Station Gallery, Tokyo; Daimaru Museum, Umeda, Japan; Bankside Gallery, London; Birmingham Museum & Art Gallery, Birmingham. Pre-Raphaelite paintings from the Manchester City Art Gallery , Manchester, 1993, pp 14–15, illus p 16, fig 4. See also pl 9 for the Manchester oil sketch. Art Gallery of New South Wales Annual Report 1992 [for the year ended 30 June 1992] , Sydney, 1992, p 37. For the year ended 30 June 1992. Regarding conservation treatment. Art Gallery of New South Wales annual report 1993 , Sydney, 1993, p 26. For the year ended 30 June 1993. Regarding conservation treatment. Visions of love and life , Virginia, 1995, p 84 under no 7, illus p 84 fig 20. See no 7 for drawing. In perfect harmony: picture + frame , Amsterdam, 1995, p 59. The art of Ford Madox Brown , Pennsylvania, 1998, pp 5, 15–17, 30, 41, 47, 49, 53–54, 56, 59, 65, 83, 98, 100, 110–11, 131–33, illus fig 14, col illus, pl II. The Liverpool Academy and other exhibitions of contemporary art in Liverpool 1774–1867: a history and index of artists and works exhibited , Liverpool, 1998, pp 12, 105, 723. Dictionary of artists , Paris, 2006, vol 2, p 1321. 14 vols. The art of the pre-Raphaelites , Princeton, 2000, pp 41–42, 56, 89, 92, 158, 192, col illus p 56 fig 37. Pre-Raphaelites and Olympians, selected works of Victorian art from the John and Julie Schaeffer and the Art Gallery of New South Wales collections , Sydney, 2001, pp 5, 7, 8, col illus pp 6 (detail), 8. Art Gallery of New South Wales annual report 2002 , Sydney, 2002, p 11. For the year ended 30 June 2002. Cecil Higgins Art Gallery: watercolours and drawings , Bedfordshire, 2002, p 39. Mentions Sydney picture in relation to Bedford drawing. Eccleston Du Faur: man of vision , Berowra, 2004, p 50. Du Faur’s report on the conservation of pictures; Du Faur’s 1906 lecture on the conservation of paintings with special reference to Brown’s Chaucer. Art Gallery of New South Wales annual report 2004 [for the year ended 30 June 2004] , Sydney, 2004, p 23. For the year ended 30 June 2004. Pre-Raphaelite painting techniques , London, 2004, pp 27, 59, 60, 67, 92–96, 122, 142, col illus p 92, fig 39, pp 93–94, figs 40–46 (details). See also p 25 for Ashmolean oil sketch, and pp 51, 121–23 for Tate replica. Chaucer: an Oxford guide , Oxford, 2005, p 521, illus p 522. The Cambridge illuminations , London, 2005, pp 274–76, no 129, col illus p 275. Troilus and Criseyde frontispiece. Medievalism: the middle ages in modern England , New Haven, 2007, pp 156, 158. Making history: antiquaries in Britain, 1707–2007 , London, 2007, p 170, under no 118. See pp 170–71, no 118 for Tate replica. vision: observation and imagination in British art, 1750–1950 , Ghent, 2007, p 275. See no 195 for oil sketch. Ford Madox Brown the unofficial Pre-Raphaelite: works on paper by Ford Madox Brown from Birmingham Museums and Art Gallery , London, 2008, pp 12, 25–27, 49–50, 52, 54, 63–66. Drawings illus pp 23, 42–43, 47. Index of Murch and his restorations of paintings at the National Art Gallery of NSW 1899–1906 , Sydney, Nov 2009, p 53. Manuscript. Victorian visions: nineteenth century art from the John Schaeffer collection , Sydney, 2010, pp 9, 19. Ford Madox Brown: Pre-Raphaelite pioneer , London, 2011-2012. Athenaeum , 'Fine-Art Gossip', London, 01 Sep 1906, pp 249–50: p 250. Victorian radicals from the Pre-Raphaelites to the Arts & Crafts movement , New York, 2018, pp 121–22, col illus p 121. Pre-Raphaelite drawing , Birmingham, 2011, p 35, col illus p 38, fig 34. See also pp 214–15 and figs 33, 35 for drawings. New Zealand Herald , ‘Huge paintings create pageant of the past’, Auckland, 29 Jan 2011, p [B18]. British and foreign correspondence BF11/1908, letter from the Birmingham Museum and Art Gallery , 01 Jan 1908. Thanking the gallery for sending a photograph which helped in identifying drawings in the Birmingham collection. National Art Gallery of New South Wales Bi-monthly conversational discussions, 1906–7 , ‘Third bi-monthly conversational discussion at the Art Gallery of NSW, 12 July 1906’, Sydney, 1910, pp 25–36: 25–28, 30–36. Sydney Morning Herald , ‘Mr. Brown and his pictures. To the editor of the Herald’, Sydney, 09 Jan 1877, p 6. Athenaeum , ‘Fine arts – exhibition of works of Ford Madox Brown at the Grafton Gallery’, London, 13 Feb 1897, pp 220–21. Ford Madox Brown: a catalogue raisonné , New Haven, 2010, vol 1, pp 5, 6, 7, 18, 22, 35, 37, 38, 47, 48, 53–80, nos A40.1–53, 81, 82, 84, 92, 96, 114, 117, 118, 119, 120, 122, 125, 132, 133, 134, 182, 216, 236, 250, 262, 266, 275, vol 2, pp 371, 381, 384, 389, 390, 394, 395, 416, 420, 436, 440, 443, 523, 535, 558, 560, 567, 576, 580, 593. The reference in Bennett 2010 to Literary Gazette, 17 May 1851 is an error- correct issue is from 24 May 1851. Times , ‘Mr Plint’s collection of English pictures’, London, 08 Mar 1862, p 8. Art Journal , ‘The provincial exhibitions – Liverpool Academy’, London, Oct 1858, p 309. Critic , 'Talk of the studios', 30 Oct 1858, p 737. Manchester Guardian , ‘The sale of Mr Plint’s pictures: a notice of the principal works’, Manchester, 04 Mar 1862, p 3. Christian Science Monitor , ‘A survey of Australian art: Australians abroad in the galleries’, Boston, 09 Sep 1918, p 14. Look , 'The Chaucer Tales', Sydney, Mar 2006, pp 18, 19, col illus p 18. Pre-Raphaelite vision: truth to nature , London, 2004-2005, p 66 under no 26, illus p 67, fig 16. For Cardiff oil sketch see no 26. Men at work: art and labour in mid-Victorian Britain , New Haven, 2005, pp 42–44, illus p 43. Love and Death: art in the age of Queen Victoria , Adelaide, 2001-2002, pp 63–69, 86–87, 194, 207, col illus pp 62, 67 (details), 195. Art Gallery of New South Wales annual report 1999 , 'Director's Introduction', Sydney, 1999, pp 5–7. British painting 1800–1990 in Australian and New Zealand public collections , Sydney, 1997, p 58, no 271, col illus p 10. Art Gallery of New South Wales catalogue of British paintings , Sydney, 1987, p 21, illus p 20.. The Pre-Raphaelites , London, 1984, pp 15, 52–55, illus p 14. Also reprinted with additions and corrections 1994. For oil sketches and replica see also nos 6–7, 20. The Pre-Raphaelites , London, 1981, p 46, col illus p 47. History and legend in some selected paintings at the Art Gallery of New South Wales , Sydney, 1980, p 15. And when did you last see your father , London, 1978, pp 44, 47, 58, 61, 72. See also p 59 for illustration of the Tate replica. Ford Madox Brown and the Pre-Raphaelite history picture , New York, 1978, pp 87, 96–171, 177–78, 188–95, 203–05, 231–33, illus p 49. PhD Bryn Mawr College, Pennsylvania, 1973. See also figs 44–45, 61 for sketches and drawing. Acquisitions 1975 , Sydney, 1975. The Pre-Raphaelite landscape , Oxford, 1973, pp 4–6, 14, 31, 34, 36, 38, 44, 97, illus pl 6. Art Gallery of New South Wales picturebook , Sydney, 1972, col illus p 26. The Pre-Raphaelites , London, 1970, p 12. See p 13 fig 8 for illustration of preparatory drawing. Ford Madox Brown 1821-1893 , Liverpool, 1964, pp 3, 4, 5, 8, 13 no 11, 14, illus pl 2. For oil sketches and drawings see nos 12–14, 50–58. The Nazarenes: a brotherhood of German painters in Rome , Oxford, 1964, pp 81, 130. Pl 72b for pencil study. Pre-Raphaelite art: paintings, drawings, engravings, sculpture, tapestries, chintzes, wallpapers , Sydney, 1962, pp 5, 7, 9–10, no 3, illus pl 2 and col illus cover. The Adelaide Festival of Arts 1962: Special exhibitions at the National Gallery of South Australia , 'The Pre-Raphaelites and their circle', Adelaide, 1962, np, no 3. Adventures in Art: Australian National Art Gallery pictures , Sydney, circa 1945, p 4. Catalogue of the permanent collection of drawings in pen, pencil, charcoal and chalk, etc., including cartoons for stained glass , Birmingham, 1939, pp 30–37. New South Wales Art Gallery pictures , Sydney, 1931, col illus pl 11. The English Pre-Raphaelite painters: their associates and successors , London, 1901, p 19. The illustration after p 20 is from the Tate replica. Præraphaelite diaries and letters , 'Madox Brown's diary etc 1844-56', London, 1900, pp 61–76, 81, 93, 94, 95, 97, 103–05, 107–09, 112, 115–17, 152, 162–69, 185, 199. Daily News , ‘Fine arts – exhibition of the Royal Academy (first notice)’, London, 03 May 1851, p 6. Morning Post , ‘The exhibition of the Royal Academy – private view’, London, 03 May 1851, p 5. Times , ‘Exhibition of the Royal Academy (private view): first notice’, London, 03 May 1851, p 8. Builder , 'The Royal Academy', London, 18 Mar 1865, pp 292–93: p 292. Observer , ‘Royal Academy of Arts – second notice’, London, 12 Mar 1865, suppl p 2. Illustrated London News , ‘Royal Academy exhibition (second notice)’, London, 17 May 1851, pp 415–16. Literary Gazette , 'The Royal Academy', London, 24 May 1851, p 365. Athenaeum , 'Royal Academy', London, 24 May 1851, pp 559–60: p 560. Bell's Weekly Messenger , ‘Royal Academy – fourth notice’, London, 31 May 1851, p 2. ‘The artist may do something by and bye, but he has much to learn before he is equal to group such a subject as he has here most unwisely attempted to delineate’. Aberdeen Journal , ‘Notes on notable things, no II – the Royal Academy of Arts’, Aberdeen, 04 Jun 1851, p 5. The exhibition of the Royal Academy of arts... the eighty third , London, 1851, pp 20–21, no 380. Art Journal , ‘The Royal Academy: the eighty-third exhibition, 1851’, London, 1851, pp 153–162: p 157. Art Journal , ‘Exhibition of sketches and drawings’, London, 1851, pp 259–60: p 260. Art Journal , ‘The exhibition of the Royal Academy, 1852, the eighty-fourth’, London, 01 Jun 1952, pp 165–76: p 175. Spectator , 'Fine arts – winter exhibition of sketches and drawings’, London, 18 Dec 1852, p 1212. Study for the head of the Black Prince ‘in the great picture exhibited last year’. Observer , ‘Universal exhibition of the fine arts in Paris’, London, 02 Oct 1853, p 5. Paris Universal Exhibition 1855. Catalogue of the works exhibited in the British section of the exhibition , London, 1855, p 168, no 746. Exposition Universelle de 1855: explication des ouvrages de peinture, sculpture, gravure, lithographie et architecture... , Paris, 1855, p 86, no 746. Daily News , ‘The Paris Universal Exhibition’, London, 13 Apr 1855, p 2. Morning Post , 'Paris Universal Exhibition', London, 04 Sep 1855, p 3. The Artist , ‘From a correspondent’, New York, 03 Feb 1855, p 27. The picture to be sent for exhibition in Paris. Literary Gazette , ‘Crystal Palace Gallery’, London, 30 Aug 1856, pp 642–43: p 642. Morning Post , ‘Fine arts – “Mixed schools” – Crystal Palace’, London, 30 Sep 1856, p 3. Morning Post , ‘Fine arts – Picture Gallery – Crystal Palace’, London, 18 Nov 1856, p 3. Les beaux-arts en Europe 1855 , Paris, 1857, p 18. Catalogue of the Liverpool Academy’s thirty-fourth exhibition , Liverpool, 1858, p 13, no 140. National Magazine , ‘The Crystal Palace Picture Gallery’, London, Sep 1858, pp 309–12: pp 309–10. Manchester Guardian , 'Liverpool', Manchester, 06 Sep 1858, p 4. Caledonian Mercury , ‘Liverpool Academy exhibition of pictures’, Edinburgh, 08 Sep 1858, p 4. Caledonian Mercury , 'Literature', Edinburgh, 08 Sep 1858, p 4. North Wales Chronicle , [No title], Bangor, 11 Sep 1858, p 6. Englishwoman’s Review and Home Newspaper , ‘Exhibition of pictures at Liverpool’, London, 11 Sep 1858, p 135. Literary Gazette , ‘Miscellanea’, London, 11 Sep 1858, pp 348–50: p 348. John Bull and Britannia , ‘Facts in art, science, and literature’, London, 11 Sep 1858, p 589. North Wales Chronicle , 'Exhibition of pictures at Liverpool', Bangor, 11 Sep 1858, p 6. Standard , [No title], 20 Sep 1858, p 3. Nottinghamshire Guardian , ‘General news’, Nottingham, 23 Sep 1858, p 7. Nottinghamshire Guardian , [No title], Nottingham, 23 Sep 1858, p 7. Liverpool Mercury , ‘Liverpool Academy’s exhibition’, Liverpool, 16 Sep 1859, p 6. Times , ‘Sale of Pre-Raffaelite pictures’, London, 10 Mar 1862, p 10. Leeds Mercury , ‘Sale of the late Mr TE Plint’s pictures’, Leeds, 10 Mar 1862, p 3. Daily News , ‘Sale of the late Mr Plint’s collection’, London, 11 Mar 1862, p 3. Men of the time: a biographical dictionary of eminent living characters of both sexes , London, 1865, p 116. The exhibition of Work, and other paintings, by Ford Madox Brown, at the Gallery, 191 Piccadilly , London, 1865, pp 3–4, no 1, p 19, no 45. Ashmolean oil sketch. Art Journal , ‘Mr. F Madox Brown’s pictures’, London, 1865, p 156. Observer , ‘Mr Madox Brown’s pictures, 191, Piccadilly’, London, 12 Mar 1865, p 5. London review of politics, society, literature, art, and science , ‘Mr Madox Brown’s pictures’, London, 18 Mar 1865, p 299. Builder , ‘Work! at Mr Madox Brown’s exhibition of pictures’, London, 18 Mar 1865, p 186. Daily Telegraph , ‘Mr Madox Brown’s exhibition’, London, 24 Mar 1865, p 3. Pall Mall Gazette , ‘Mr Madox Brown’s exhibition’, London, 29 Mar 1865, pp 10–11: p 10. Portraits of men of eminence : in literature, science and art : with biographical memoirs , London, 1863-1866, pp 29, 30. 6 vols. Scribner’s monthly , ‘An English art reformer: Ford Madox Brown’, New York, Jun 1872, pp 157–61: pp 158–59. Glasgow Herald , ‘Royal Association for Promotion of the Fine Arts – distribution of prizes’, Glasgow, 29 Jul 1872, p 3. Art Journal , ‘The works of Ford Madox Brown’, London, 1873, pp 105–08: p 107. Treasury of Literature and The Ladies’ Treasury , ‘An English art reformer’, 01 Feb 1873, pp 73–76: p 74. Transactions of the Manchester Literary Club , ‘The works of Mr Ford Madox Brown [read Jan 11 1875]’, Manchester, 1874-1875, pp 40–47: p 42. Sixth annual report of the New South Wales Academy of Art [for the year 1876–77] , Sydney, 1877, p 5. Schedule of pictures, the property of the Art Gallery of New South Wales and of the New South Wales Academy of Art. Sydney Morning Herald , ‘Additions to the Art Gallery’, Sydney, 25 Dec 1876, p 5. Sydney Morning Herald , ‘Additions to the Art Gallery – To the editor of the Herald [letter]’, Sydney, 30 Dec 1876, p 8. Art Journal , ‘Art-notes from the continent’, London, Jan 1877, p 20. Sydney Morning Herald , ‘Chaucer before the court of Edward III. To the editor of the Herald’, Sydney, 03 Jan 1877, p 3. Brisbane Courier , 'Our Sydney Letter', Brisbane, 04 Jan 1877, p 3. Singleton Argus and Upper Hunter General Advocate , ‘Metropolitan Gossip’, Singleton, 06 Jan 1877, p 2. Correspondence 2/1878, note by Alfred Stephens , 12 Feb 1877. Note by Alfred Stephens. Concerning Australian Museum’s offer to find space for the Chaucer. General Correspondence 8/1877 , New South Wales, 13 Feb 1877. Australian Museum agrees to hang the painting. Sydney Morning Herald , ‘Art at the Antipodes’, Sydney, 30 Mar 1877, p 3. Sydney Morning Herald , ‘Art at the Antipodes (from The Builder)’, Sydney, 30 Mar 1877, p 3.